QUALITY SERVICE & CUSTOMER SATISFACTION GUARANTEED WHEN CHOOSING BETTER CHOICE HEATING & AIR CONDITIONING. Through our close partnership with AMS Financial, we offer a variety of flexible options for financing your new product or system. That way, you can invest in your home’s comfort or respond to an unexpected heating and cooling need without breaking your monthly budget. WHY DO YOU NEED REGULAR MAINTENANCE OF YOUR EQUIPMENT? 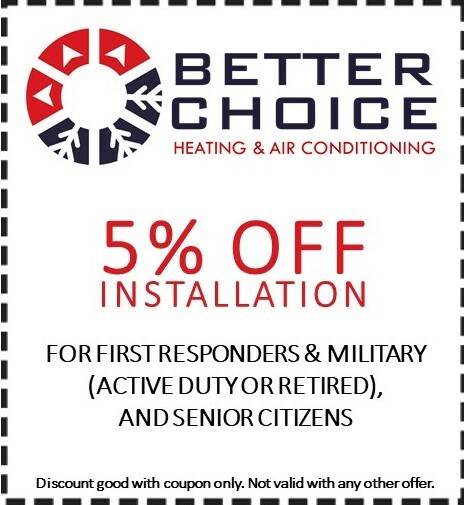 “I use Better Choice for Heating & Air Conditioning. They provide me with services twice a year, once for the winter check up and once for the summer check up. They always change the filter on the A/C and then they check the coils and everything. They check both the Air Conditioning and the Heating units. “I hired the company to install a new furnace and AC unit and for any repairs I have needed. “Our gas furnace wasn't igniting so in addition to the usual clean and check that we have done in October, the technicians tested, replaced a part and repaired our furnace. After checking, cleaning and testing the system parts, they replaced a bad board.